Did I Hear Someone Say We Need an Updated Basic D&D Sheet? Oh, wait - that was just the voices in my head again. Shut up, you! 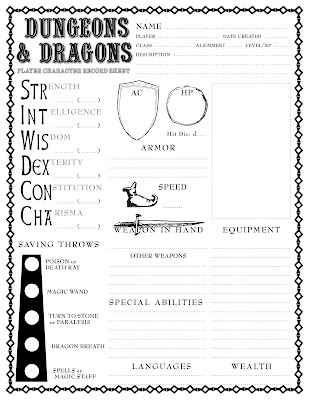 Seriously, I came to the realization recently that I had posted nifty new character sheets for Swords & Wizardry, but the only sheet I'd posted for B/X (Moldvay/Cook Basic/Expert) Dungeons & Dragons was my old sheet from several years ago. I think it's high time I rectified that situation. Most excellent! We've been using your older D&D sheets for Labyrinth Lord, but I'll probably make these available as well. Dude...you read my mind. I've been looking for a decent (i.e. one-page) sheet on-line all evening! Nice piece and thanks for the reminder - my group and I built a character sheet concept that I finalized into a pretty sweet hand-drawn sheet that we all use now. I should post on my blog later this week.